Sometimes, learners need to be secure with a number of FACTS before they can access the next stage in their learning. Question Card Swap is an active, fun way to teach a number of such key facts. Step 1: Decide the key facts that you really want learners to know and express them as questions and answers (about 12 facts is a good number). e.g. "Q. When was the treaty of Versailles signed? A. 28 June 1919"
or "Q. What is the name of the number or expression on the top of a fraction called? A. The numerator." or...you get the idea...it can be anything. 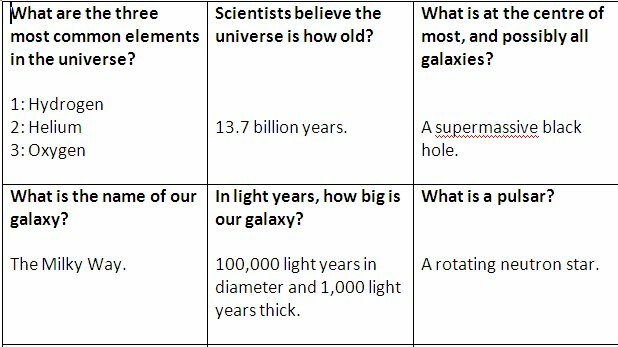 Step 2: (easy way) Make up small cards (I use a 3x5 table in Word to get 15 facts on one side of A4) containing BOTH the question and answer. Two copies will cover a class of 30 learners. Step 2: (even easier way, but dependent on students being able to read each other's handwriting) Display all 12 Q&As (numbered) on the board. Number pupils from 1 to 12 and ask them to copy down their question and answer neatly onto a scrap of paper. If you have, say, 28 pupils number 1 to 12, 1 to 12 then 1 to 4 - it really doesn't matter if there are more copies of some questions than others. "Move around and ask someone your question. If they don't know the answer, no problem - just tell them! They also ask you their question and tell you the answer if necessary. Then you swap cards and immediately both move on to ask someone else your new question." Step 4: Watch them go! Learners will find themselves being asked questions that they know or questions that they don't but it doesn't matter, they will get the answer anyway. They will also, in a short space of time, hear the question and answer and then read the question and answer. They will also almost certainly get the same question again before the activity ends, leading to yet more repetition. It is the repetition that does the heavy lifting here - but importantly it's not the teacher doing the repetition, it's the learners. Learners also have ownership of the knowledge from the start, as they are holding the cards and teaching their peers. Repeat the same activity at the end of the unit to move the facts from short-term to long-term memory. I work in yr 6 and have adapted the game. After a practise science test I asked the children to write a question on a piece of paper that they got wrong (they discussed these in table groups to avoid all the same questions). The correct answers were given and written on the same piece of paper. Then the children asked each other the questions as in your original quiz quiz trade. We have also done the same in maths. Both have worked well. In addition, I did a spelling test without the children previously learning them. Then I gave them cards with the spellings on and the children played trade with these, and so on. Thank you for the idea, it was great. This is a great way to adapt the idea, Jackie - turning the learner's "mistakes" into a positive, fun activity. Brilliant. I used this with Year 6 when we started learning about micro-organisms. It was a fun way to introduce a topic which children don't have a lot of prior knowledge on. This is a fantastic and fun way for repetitions by learners themselves! Thank you.